Commander Denise Jacqueline McCallaCreary is now living her best life volunteering and pursuing an acting career in film and television. She is a native of Kingston, Jamaica, West Indies. 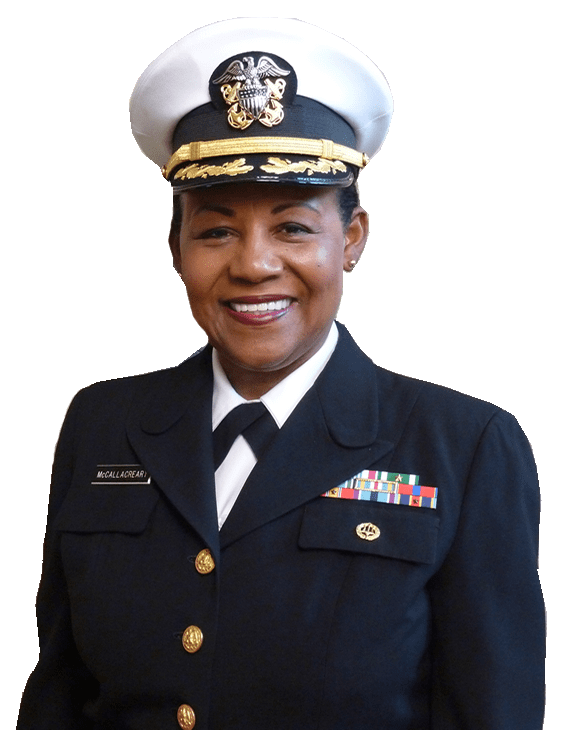 She enlisted in the Naval Reserves in October 1973, and served as an Aviation Storekeeper at Naval Air Station, Glenview, Illinois. After completing a Bachelor of Arts in Business Management and Spanish from Northeastern Illinois University, Chicago in 1978, she entered military duty full time. She accepted Temporary Active duty (TEMAC) assignment with the Navy Recruiting District, Milwaukee, Wisconsin as the Recruiting District’s community relations Petty Officer. For excellence in support of recruiting in that assignment, she was awarded the Recruiting Gold wreath. During this assignment, she applied and was selected to attend Officer Candidate School at Newport, Rhode Island. She was commissioned an Ensign in November 1979. Her first assignment was as the Public Affairs Officer, Naval Air Station, Bermuda. After serving two years, she reported for duty in 1982 with the Bureau of Naval Personnel (BUPERS), Washington, D.C. Commander McCallaCreary served as the Assistant Head, Family Housing, Plans and Policy Division. The division was responsible for administering Navy’s housing program worldwide. In July 1985, she reported to the Naval Postgraduate School, Monterey, California, as a student. In March 1987 she was awarded a Master of Science Degree in Transportation Management, and was temporarily assigned as Assistant Public Affairs Officer at the school. In June 1987, she reported to the Navy Transportation Management School, Oakland, California. Upon successful completion of Transportation Management School, she reported to Naval Air Station Moffett Field, California where she served concurrently as the Administrative Officer and Director, Family Service Center from December 1987 to April 1991. She later transferred to Naval Station, Treasure Island, California as the Director, Family Service Center where she served until October 1991. In October 1991, she assumed command of the Naval Transient Personnel Unit, Treasure Island, California. Following this tour, Commander McCallaCreary was selected to attend the Naval War College, Newport, Rhode Island where she was awarded a Master of Arts Degree in National Security and Strategic Studies in March 1995. In April 1995 she reported to U.S. Central Command, MacDill Air Force Base, Tampa, Florida where she served concurrently as the Navy/Marine Corps Branch Chief and the Navy Element Executive Officer. She is also a graduate of the senior staff course at the Armed Forces Staff College, Norfolk, Virginia. In 1998, she reported to the Naval Postgraduate School and served as the National Security Affairs Department Curricular Officer. She retired November 2000 after a successful career spanning 27 years. Her military awards and decorations include Joint Service Meritorious medal; Joint Service Achievement medal; Navy and Marine Corps Commendation medal with gold star in lieu of second award; Navy Meritorious Service medal; Navy Reserve Meritorious Service medal; Joint Meritorious Unit Award; National Defense Medal with bronze star in lieu of second award; Humanitarian Service medal; and the Overseas Service Ribbon. She has received civilian recognition for leadership in the Northern California community. She has accomplished the Advance Communication Bronze level in the Toastmasters International Program. She is a past appointee to the City of San Jose Project Diversity Screening Commission. She is the President of, NNOA, President & Chief Executive Officer, Jamaican American Association of Northern California; President, Almaden Valley Orators Toastmasters Club; a life member of the National Naval Officers Association (NNOA) and their Navy Reserve Officer Training Corps (NROTC) Volunteer Coordinator; life member of the Military Officers Association; Past Retiree Representative on the National Naval Officers Association Executive Board; and a founding member of the Merl Grove High School Jamaica, Northeast American Past Students Chapter.